Professor Fairfield’s paper has already sparked some great discussion, and I suspect that the session will also. The first Metanomics session last week maxed out the sim, so if you are a Second Life user and are interested in attending the event live, I suggest showing up on the early side. All Metanomics sessions are also available on SLCN.TV. I just wanted to let readers know that there are usually other islands that will stream the video from Metanomics sessions. 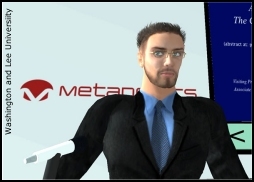 Join the “Metanomics” group in Second Life, and you can will get landmarks as islands open up. I just wanted to let readers know that there are usually other islands that will stream the video from Metanomics sessions.